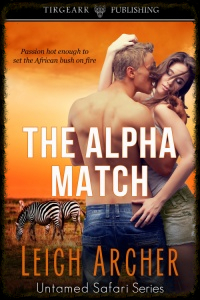 Head over to your favourite online bookstore today for your copy of The Alpha Match delivered instantly to your e-reader device. Conservationists, Caro Hannah and Ben Duval, must work together to introduce endangered African wild dogs to a reserve four years after their love affair ended. But the challenges of their profession pale into insignificance beside the personal obstacles they must overcome in order to bring closure to the heartbreaking events of four years before, or reignite a passion hot enough to burn up the African bush.